When you become a dog owner, one of your biggest fears is losing your dog. However, should your Yorkshire Terrier ever become lost, you can use a Yorkie rescue to help you find your lost pooch. How? A Yorkie rescue receives plenty of abandoned and lost dogs frequently. Thus, there’s a good chance your Yorkie will turn up there. 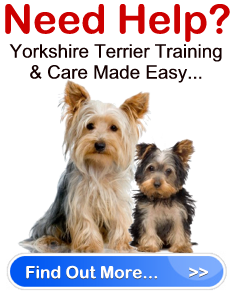 Contact the local Yorkie rescue or any dog rescue that may be in your area. You should also contact the local humane society. Provide them with all of the information about your dog, and send them an updated photo of the dog. If the rescue has a website, ask them to post your dog in their lost and found section, so web surfers get the chance to see your dog. Just remember that you need to play an active role in finding your lost Yorkie. Don’t forget, your dog may not be the only one of its kind missing. If a Yorkshire Terrier is found, it may not be yours, and sometimes shelters and a Yorkie rescue will not be able to determine whether or not the lost dog is yours from your descriptions or the picture. Therefore, make sure you visit and call these places often to check out any dogs they have found yourself. Making pamphlets and posting them around your neighborhood and within a 1 mile radius. You should also leave them with pet stores, your Vet, shelters, etc. Keep in mind, when making pamphlets do not divulge any vital information about your pet (ex. Birthmarks, lazy eye, etc.) that you may need to use to ensure that the pet someone has found is yours. You should also refrain from putting your name and address on the pamphlet. Just leave a number where they can reach you. This is for your own safety. Call the transportation office of your state to find out if your Yorkie has been hit by a car. This is a very sad task, but it will stop your search if this unfortunate situation has occurred. Offer a reward. If you offer a reasonable reward, people will be more interested in looking for your Yorkie, and giving him back, if he’s found. Under no circumstances should you pay someone the reward until you have your dog safely in your possession. Remember, the most important aspect of having a lost dog is to find him. Regardless of what has happened to him, you need to know. Therefore, don’t give up your search, and don’t forget that a Yorkie rescue is a great place to turn for support and assistance.